The Ashtead small Art Nouveau 1 light floral Tiffany table lamp, with a floral border of autumnal colours made from mottled glass, enhanced by highlighted dark bronze finish fittings. 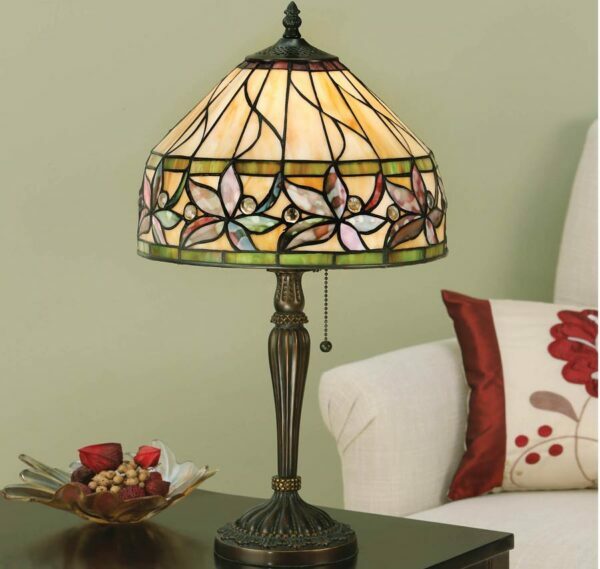 A lovely elegant handmade Art Nouveau style small floral Tiffany table lamp. A stunning shade design depicting autumnal flowers around the shade rim, rendered in beautiful mottled art glass, with shades of brown, green, purple, orange and red. The shade body has panels of amber cream, with three bands of rippled art glass in shades of purple and green that will sparkle when illuminated. The neutral base colour allows the vibrant hues to really stand out. The 30cm shade sits on a detailed traditional ribbed dark bronze finish base, with a single pull cord on/off chain. This is a hand-crafted Tiffany table lamp and the shade colours may differ slightly from the image shown, as each piece of glass is hand-made and may differ slightly in colour or shade. This should not be seen as a fault, rather something that makes each Tiffany shade unique. A wonderful Art Nouveau floral design small Tiffany table lamp, hand crafted using art glass that will transform any room whether lit or not. Part of the Ashtead range of hand made Tiffany lights by Interiors 1900.